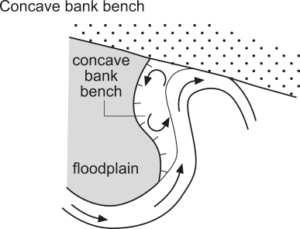 Bank-attached unit, often with a low ridge across the central portion parallel to the primary channel. Located along the upstream limb (i.e. along the concave bank) of relatively tight bends that abut bedrock valley margins or a flow obstruction. Often inset against floodplain. Comprise slackwater sediments (interbedded sands and mud) and organic materials. Associated with flow separation and generation of secondary currents at high flood-stage. Sedimentation occurs in sheltered backwater zones of relatively low flow velocity. Form from flow separation when the primary flow filament continues around a bend. At floodstage, flows separate from the primary filament, circulating back around the bend. This is often channelled by a ridge. During the rising stages of flood events, this process may accentuate scour on the surface of the bench. Deposition of suspended load materials subsequently occurs during waning stages.